Dit kunstwerk bevat 42 echte AK47 geweren uit de Balkan oorlog. As the work of Fred George evolves, the distortion of religious symbolism is further examined and confronted through the medium of sculpture. 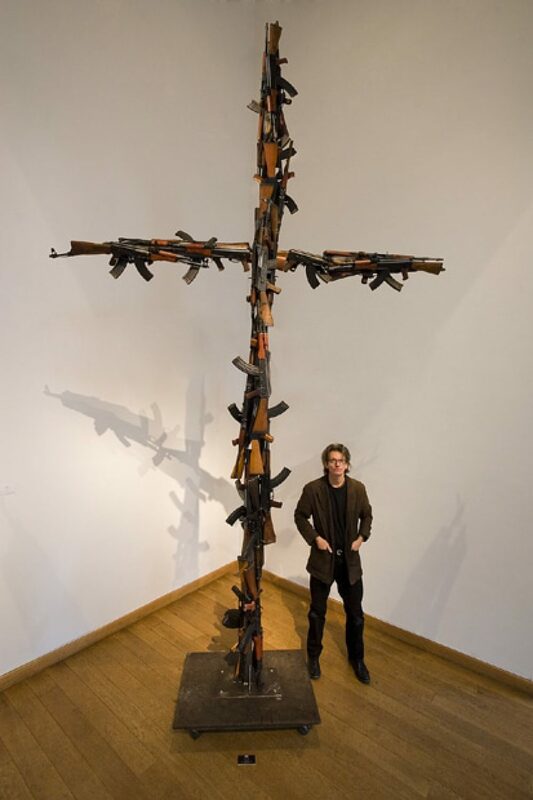 George’s five-meter crucifix, constructed from AK-47 rifles, aggressively challenges the manner in which the cross has been effectively betrayed and divorced from its original Christian connotation. It is now, once again, the symbol for war. George, with his intense political consciousness, appropriates all the tools of subliminal suggestion to disturb the viewer, invoking a deep emotional response to the atrocities occurring worldwide. Fred George’s 5-meter crucifix sculpture is made from 42 Kalashnikov rifles, the most common of all automatic weapons. It is an outcry against the perversion of the original meaning of the Christian Cross as a symbol of peace and salvation. Fred George’s works, at the same time conceptually sophisticated and targeting popular attention, apply proven artistic weapons such as shock and agitprop to shake up the viewer. His photos and sculptures are a call upon the public in a new attempt of artistic responsibility, coming from a country that in recent years often sorely missed such commitment. His works line up in the long and honorable tradition of the artist’s role as a leader in esthetic-ethical matters: “The artist in the public interest”. 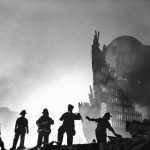 After being involved in photographing 911 in NYC and sub sequential Bush’s invasion of Iraq I became increasingly enraged at our country’s invasion of Iraq which most Americans opposed. At the time Bush was hiding behind a Religious Christianity front on his rhetoric. I had been invited to work and stage an exhibition at the Stifftung Starke in the Löwenpalais in Berlin. I had conceptualized the AK47 sculpture sometime after 911. In Berlin I was fortunate to have the space and support the finalized this sculpture at the Stiftung Starke. The AK47’s are from the Bosnia war.